The Australian Small Business Blog: Trust – The Small Business Secret Weapon? One of the most potent weapons of big businesses is their ability to build a brand. A brand creates Top of Mind awareness that remains until you are ready to buy, building familiarity until it naturally becomes a safe choice. Which do would you trust more- a brand you have heard of, or one you have never heard of? In the old days of mainframe computers, there was a saying “No one ever got fired for buying an IBM”. It was the safe choice. It always seems easier to put your trust in a big business that has been around for a long time. There is also a sense of security when you buy from a big business because if there is a problem, they are still likely to be around to fix it. This is particularly important for major purchases. The bigger the purchase, the easier it is to choose the big brand. The difficulty for small business is the time and cost to build a brand, something the big brands can afford to do. Years ago, when working in the corporate world, I wanted to try a smaller supplier as their service was highly innovative. There was a lot of resistance from senior management, not to mention barriers from our regular supplier who couldn’t (or wouldn’t) provide this service at the time in Australia. After overcoming all objections, my team was able to trial this service. Unfortunately, the small provider stuffed up. I and my team had gone out on a limb for them, and they let us down. They never got another chance with our company. On the positive side, our regular supplier soon afterwards supplied what we wanted. To be fair to their local management, they were advocating to their management that these tools should be brought to Australia, but they were denied. The fact that we were prepared to trial the equivalent from a small competitor, albeit unsuccessfully, was enough ammunition for them to convince their bosses to bring the tools to Australia. So what is the small business secret weapon? The ability to innovate is obviously key, but in addition, the ability to directly communicate with the innovator to build the trust required. The big business innovator is buried within the corporate hierarchy. What comes out instead, is a production line product, homogeneous. One size fits all. Any colour as long as it’s black (Henry Ford). And if there is a problem, you end up at a call centre in India. The small business trust factor is the knowledge that you are dealing with the owners, not the managers. People who have invested everything to make the business work, and who have the most to lose if it doesn’t. Who will go the extra mile to make sure you are happy. The business’ reputation is their reputation. This trust advantage can be the secret weapon of small business if it’s wielded with care. 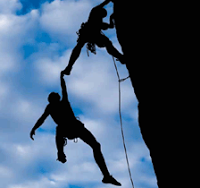 Share this article:Trust – The Small Business Secret Weapon?